For creating an edgy promotional video or a comparative review video analysis, the split screen effect is an effective tool. It helps in putting two products or topics side by side on a video screen while the narration covers the subject. The feature however, requires support from precision editing software to come through on video. In this article, we will show you how to make a split screen, or how to put two videos side by side with iMovie and iMovie alternative. 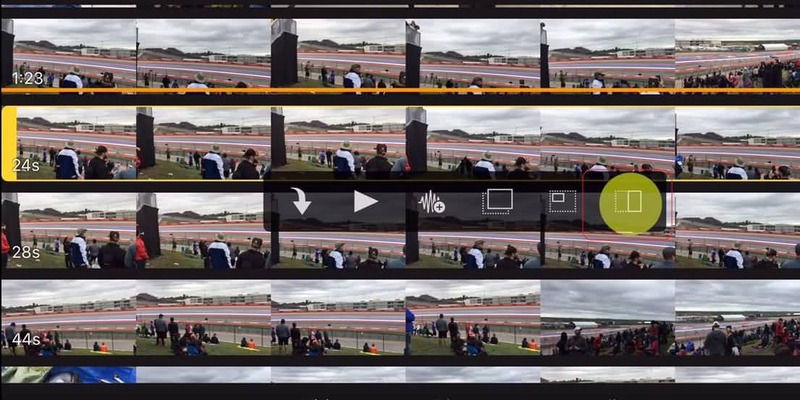 For some users using the spilt screen controls on iMovie might be a little complicated and ultimately tedious for breaking larger videos in to shorter structures. 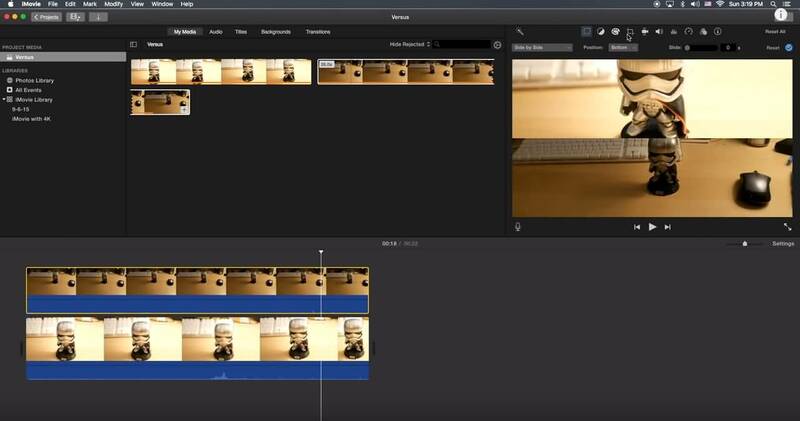 One of the best alternative to iMovie on both Mac and Windows platforms is Filmora for Macvideo editing software, which allows you to change screen saturations, the brightness and adjusts the pitch of the audio within the video. There is an ‘add chapter’ feature which allows for creating slit screen shorts for an extensive story without making it overly complicated for users. Using Filmora to make a split screen video is easy, you can get to know it with the above tutorial if you are a Windows user. For Filmora Mac users, you can follow the steps below to put the videos side by side, making a split screen video. Download Filmora now and let’s get start. 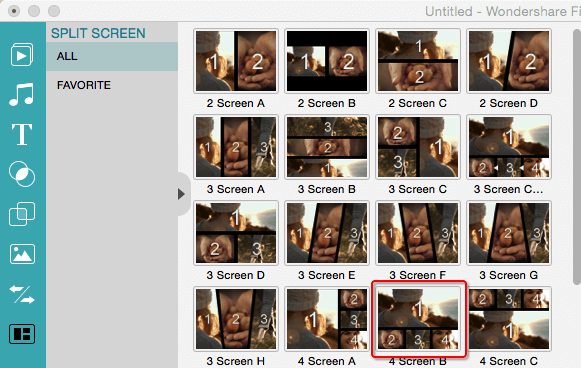 After importing you media files to the Media Library, select the Split Screen Tab to choose a screen mode. Drag the Screen Mode to the timeline, and then drag your media file to the Drop Zone of the selected Screen Mode. Turn on or turn off the audio in the Drop zone as necessary. Done! Drag the video clips to the timeline. Go the overlay settings, and then select Side by Side option. If you need to crop or zoom in to make the side by side effect look better, you can use the Crop tool to adjust. Updates: If you are using the latest iMovie version, you will find the information above is not suitable. Below, I will show you how to make a split-screen video and add transition and change the default settings for split-screen effect. 1. Drag and drop the clips that you want to show at the same time to the timeline and make sure one is above another in the timeline. 2. Click the Video Overlay Settings icon above the Viewer window and then select Split Screen option from the drop-down box. 3. You can now see the clips which has been cropped automatically in the Viewer window. You can select where the split-screen clips appear by selecting the target positions. iMovie allows you to add slide-in transitions and adjust the duration. To apply the Split-screen effects, click the Apply button. 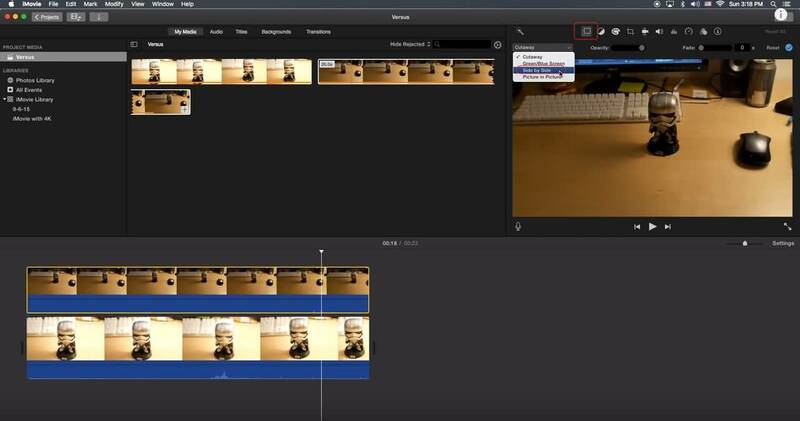 Watch the tutorial below to get the detailed information about how to make a side by side screen video with iMovie in Mac. For those who want to make a split-screen effect video on your iPhone or iPad with iMovie apps, check the steps below. If you want to use iMovie app on Android, check our picks of some best video editing apps similar to iMovie on Android. Launch your iMovie APP on your iPad/iPhone – Click on start a new project. Add both sets of video simultaneously. This will give you a side-by-side split. You can change the type of split screen from the overlay controls at the bottom of the screen. Whether you are making split-screen video with Filmora for Mac or with iMovie, you can add some transitions and adjust the durations of videos side by side. Check the video below to see what Filmora for Mac can do for you further. filmora you can do 3 videos.... imovie 2 only Already filmora is a better overall program.